View from a meeting room. In my professional video production days I was paid to go to public forums and government meetings. Sometimes you have to do things when there’s no payday involved. 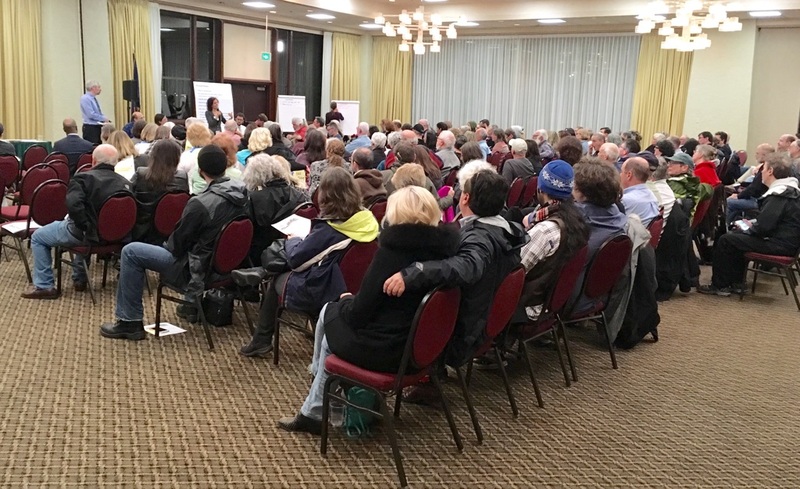 On Tuesday, March 7, North Portland community members gathered in a conference room at the Red Lion Inn for a meeting that concerned a permit for an oil recycling business on Hayden island called American Petroleum Environmental Services or APES for short. 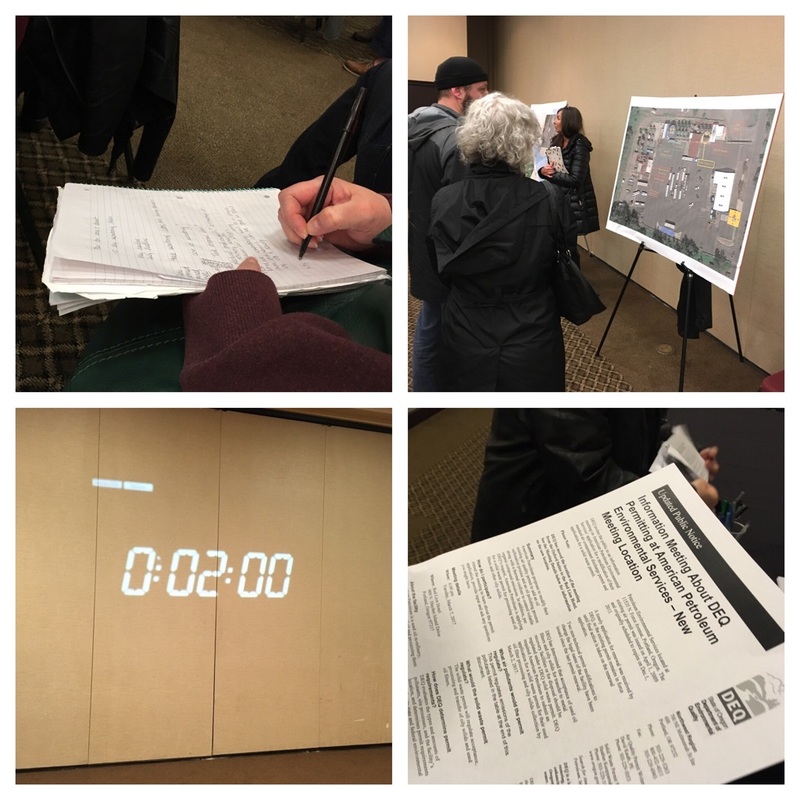 It was inevitable that we would make an effort to find out more about area air quality issues since we had been encountering an ongoing chemical odor in our Kenton neighborhood since the days we first moved in eight years ago. I lived with it and listened to the complaints. My running joke was about how sometimes, when the wind was right, we were treated to the scent of cookies from the nearby snack factory. More often the air has been filled with the byproducts of the industrial goings on that lie between the Columbia slough and businesses along Columbia Blvd. The Sunday morning before the meeting, my wife Ronna, had been watching videos about air issues in our vicinity. One showed an infrared image of a smoke stack with waves and bubbles could only represent insane toxins spewing into out atmosphere. The image cried out for some industrial music in the vein of Tone Ghosting in the background. It was scary visualizing what’s going into the air knowing I’d been breathing and smelling that. 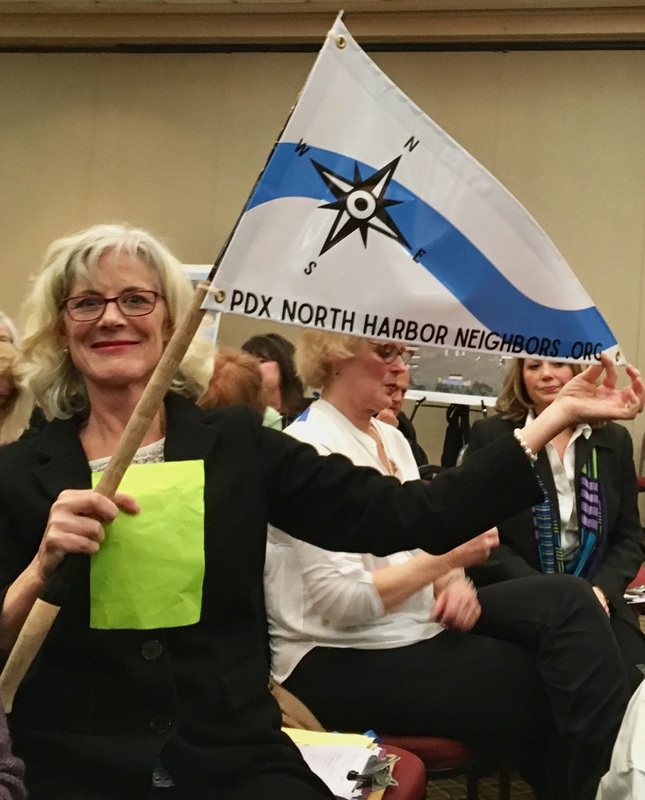 There were also videos of a woman talking about the situation in the manner of a fireside chat detailing the work of her North Harbor Neighbors group and their concerns with the performance of the State’s Department of Environmental Quality. Where is the protection I needed? Even when I first heard this song I thought it was a strange topic. I wasn’t sure why someone needed to write a song about air. Talking Head’s singer and songwriter David Bryne has probably never been to Hayden Island. Clear, pollution free air to breath is not something to overlook and even though it’s a strange song subject the reality of polluted air is alarming. It’s worse to smell it and suffer health complications as a result. 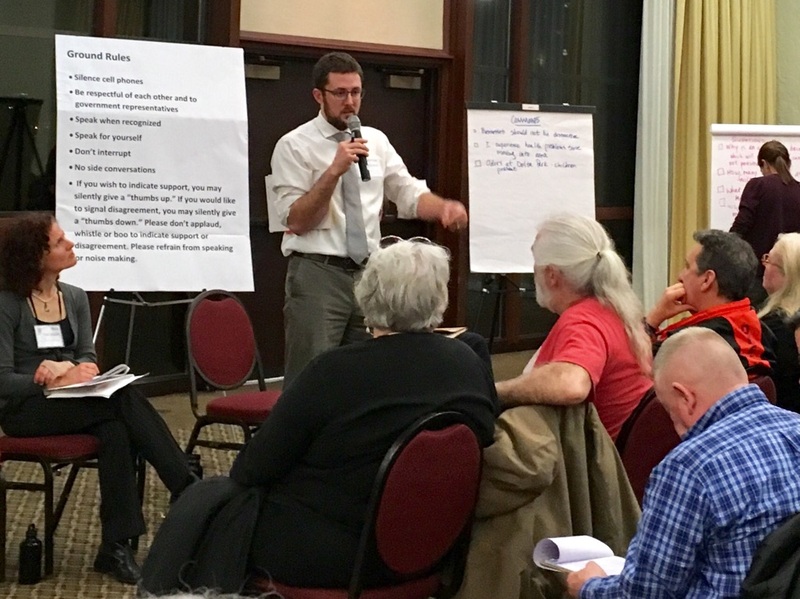 The forum gave citizens an opportunity to question DEQ employees and make comments. I wanted to see some government employees taken to task. Any of us would be yelled at by our bosses if we did what these employees did or in this case didn’t do. The moderator was a former high school teacher who presented meeting guidelines in a way that meant he had experience with keeping people in line. His list was meant to prevent the meeting from devolving into chaos or a public flogging. Attendees were encouraged to raise thumbs up or down when reacting to people’s comments which made for a lively and less disruptive participation tool. Some questions revealed that knowledgeable people were familiar with technical aspects of the situation. Hearing about a thermal oxidizer and the company being accused of being a title 5 pollutor, which is scary regardless of what kind of scale we’re talking about, were concepts over my head so I was glad to know some people knew what was going on. It was revealed that there was a tank containing PCBs on the site. I’m not sure what a PCB is but I’ve heard it’s bad stuff. How can anyone be cavalier about carcinogens? The real reporters stood on the sidelines looking bored and waiting for their chance to do their TV work. Things were heating up for me when I realized I have to live with this or maybe die from it. It occurred to me that I was onto a hot story although it’s taken me weeks to sort it out. I was hearing things like the DEQ wasn’t testing for all possible contaminates and that a regulatory overhaul wasn’t supposed to happen until next year. Given the circumstances, the pace of the state’s efforts seemed glacial. When Mary Lou Putnam spoke she seemed like a star to me. I had seen her videos and her discussions of what was feeling like a crisis. She pointed out that people were losing trust in government employees. Her question involved when the DEQ was going to do emission testing on the stack. Tied into that had been thoughts on full spectrum testing and 24/7 monitoring. The DEQ point of view. Answers were being provided by a DEQ employee with rolled up sleeves. He seemed diplomatic and careful, I’m not implying that he didn’t care but what effort he was making didn’t seem like it could be enough. Even his explanation of a one time testing process that took three hours seemed woefully inadequate. 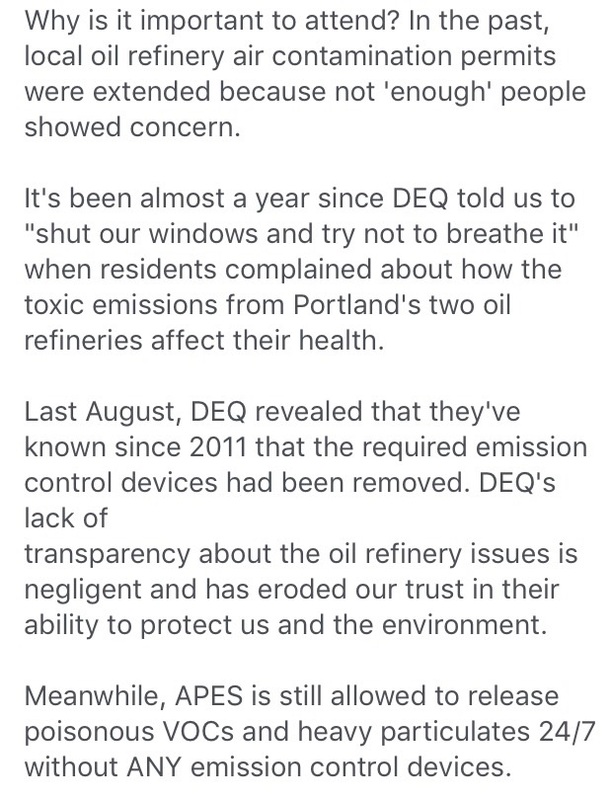 Another DEQ employee explained, “I’m committed to telling you the truth even if it’s something you don’t want to hear.” It occurred to me that people already knew the worst and they seemed like a bunch who could handle the truth. I liked how an older generation of people felt like tribal elders, with apologies to any actual tribal elders, as they began to skirt the ground rules. There were grumblings and discontented reactions. They were fighting for us. Somewhere in all the questioning an attendee suggested that a grand jury should be impaneled. There were murmured chants of, “shut ’em down.” It felt like they had the authority to tell the state employees what was right. They could have easily blown off the meeting, given up and stayed home with their windows shut, but they didn’t. Our Kenton neighborhood star Steven Glickman offered to pay for a permit to get a monitor to put on the stack. He had been the first to ask a question and later in the meeting the first to make a comment. He must have gotten there early. 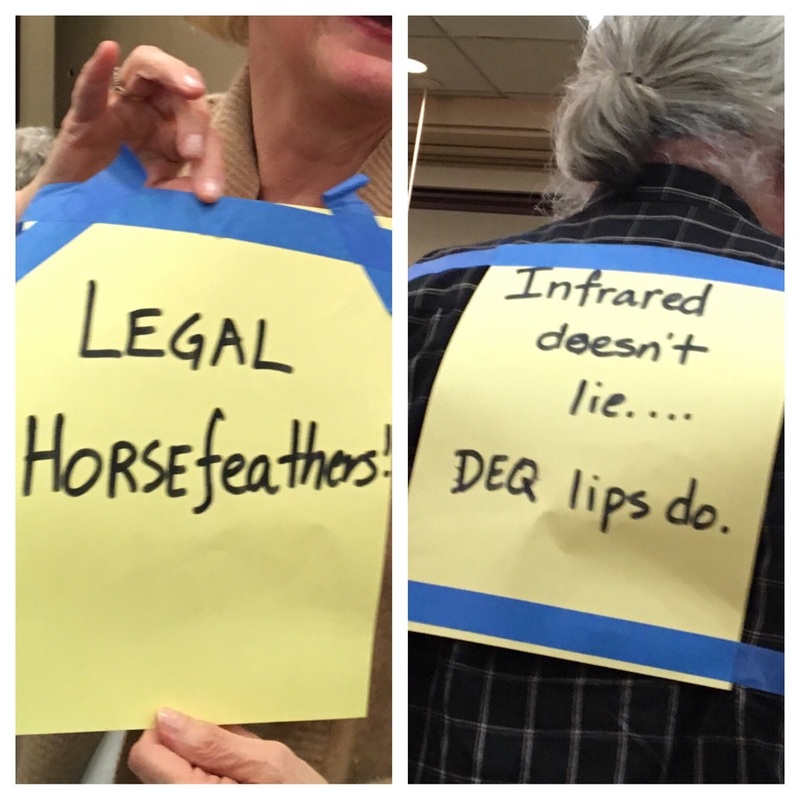 I felt lucky to have people with scientific knowledge challenging the DEQ representatives. It held them more accountable and didn’t allow them to hoodwink the audience with circuitous mumbo jumbo. The state was accused of not monitoring “this stuff” because it’s bad for business. One questioner made the point that the DEQ employees feared corporations more than the taxpayers. An insider to the oil recycling business offered up what felt like whistle blower details when he mentioned that he knew workers who left the industry due to fears of getting cancer. It had me hoping that Erin Brockovich was going to walk through the meeting room doors. I learned that there was a network of groups, coalitions and advisory committees that met and were working for cleaner air often on a voluntary basis. It occurred to me that that anyone who might be partying or playing banjos or even working multiple jobs all while breathing nasty air, well, more power to them, but it’s made me appreciate the people taking their to time to make the effort to clean up out air and bring awareness to the state employees failings. In the end there was talk of more hearings and draft permits that all seemed to amount to government workers working overtime.